Taking class at Minerva is entirely different from any other university program. Hosted on the Minerva Forum, students enter class from anywhere in the world by logging onto Minerva’s proprietary online platform. Whether they are in a coworking space in San Francisco, a residence hall in Seoul, or a coffee shop in Berlin, as long as there is Wi-Fi, class is only a few clicks away. Each class starts with the professor sharing the learning objectives for the day, before asking students thought-provoking questions related to the assigned reading. But unlike the norm of a traditional lecture, instead of the professor pontificating for an hour, the students are the main show. The seminar-style, small group discussions utilize the platform’s many features, including presentations, polls, and debates, keeping students engaged. Furthermore, everyone who is logged in can be seen across the top of the screen, so there is no way to take a seat in the back of a Forum class. The platform was designed to bring research from the science of learning to life in ways that are underutilized by, or impossible because of, the physical limitations of a traditional classroom set-up. Moreover, the synthesis of the Forum with Minerva’s curriculum is structured to help students quickly think through new concepts, make and use associations, and effectively retain new knowledge. But before Minerva created the Forum, no such educational platform existed. Instead, online classrooms more closely resembled the style of traditional lecture halls, with as many as hundreds of students in each class and no effective way of engaging in an active learning environment. So how was the Forum created? “My first reaction [to Minerva’s mission] was, ‘That’s insane. It would be nearly impossible to create that from scratch,’” reflects Matt Regan, Director of Product Design, who has been with Minerva since October 2012. He was introduced to the concept of the Forum by Jonathan Katzman, Chief Product Officer at Minerva. Before Minerva, Regan had briefly worked on a contract project designing an interactive online learning application for Pacific Gas and Electric, but found the higher education sector new — and exciting. Instead of shying away from the seemingly Herculean task, Regan was ready to take on the challenge of creating a first-of-its-kind online classroom, feeling inspired by his own positive college seminar experiences. Throughout his product design career, which spans a variety of fields, including consumer mobile applications and global news sites, Regan has applied design thinking principles to create solutions that balance the needs of both the users and business. To discover that elusive middle ground, he sets out on a design thinking cycle that begins by empathizing with those impacted by the problem at hand, defining the problem, ideating solutions, and then testing the solutions with prototypes. The product is then carefully built by an engineering team and released to users. But his job is not complete after the product is released to the public. One of the most important parts of product design is iteration, Regan believes. Updating, fixing, and enhancing the usability of the product — akin to editing multiple drafts of an essay — is crucial. Rarely does the first version of a product perfectly address the problems it was created to solve. “Designing the Forum has been a challenge since the beginning because there wasn’t anything like it that we could directly point to and take cues from, or generate inspiration from,” says Regan. Under the advisement of Founding Dean Stephen Kosslyn, the Forumwas built using principles from the science of active learning, as well as Minerva’s own product design principles. Very early Forum classes were piloted by faculty and staff on a basic yet functional prototype. These exercises produced invaluable data on the types of techniques that most engaged participants and led to lively classrooms. Based on the results of these early classes and design thinking exercises, the prototype was then continuously refined, and new and proposed features were tested on college students to validate some of the team’s thinking. One of the earliest core pieces of the seminar experience was the physical structure of the classroom. Created around the design principle of engaging deeply and enhancing focus, every student on the Forum is on screen at all times, effectively giving each a seat in the front row. This design element allows professors to easily call upon students and helps to keep them continually engaged. There is no time or space to doze off in class. And while it may seem intimidating to not know when you will be called on, it keeps the classroom focused—even with distractions like Facebook one tab away. But not all of the platform’s features were flawless, and like many other product designs the first iteration did not fully succeed. In the design and prototype stage, there was also an early push to elevate the Forum experience from not only a platform that was fully functional and reliable but one that could make class more enjoyable and meaningful. 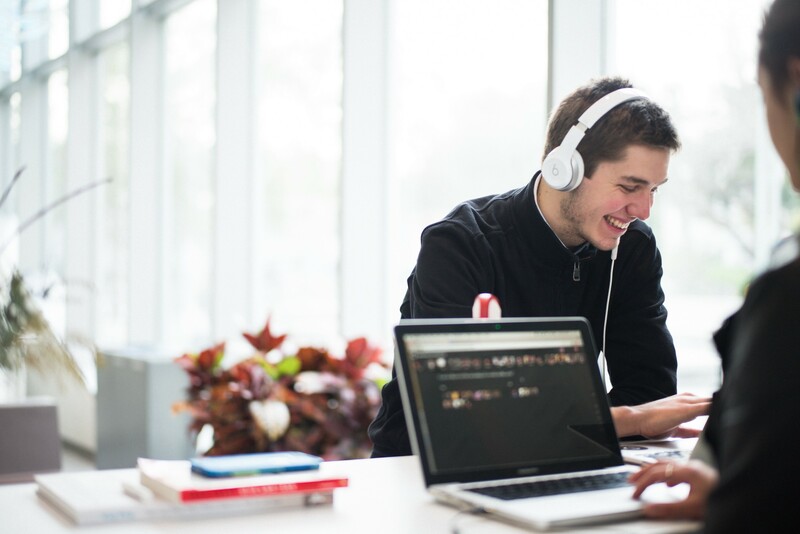 Features such as allowing students to express their emotions through a range of animations that appear on top of their video feeds went a long way in creating a more captivating and relatable experience. To solve this issue, Regan and his team focused on simplifying the system by automating some of the controls, such as poll initiation and breakout groups, utilizing a timeline feature. These improvements not only helped professors organize the classroom, they enabled them to more easily transition between activities, which led to an improved student experience that focused on the pedagogy and not the technology. Currently, the Forum is used by all four cohorts of Minerva students and their teaching faculty who are located throughout the world. Minerva has set out to educate students to succeed in a complex, ever-changing world and the Forum is a key component of this goal.